For you true float enthusiasts, we found this cute but spacious tank which at only a little over $6,000 would be perfect for home use. We met Jeremy last year and have been hearing about his development of The Escape Pod for a while so we were so excited to finally see it in person. Once I have to take my tank over to the new office, I may have to get a new home tank before going through withdrawals when I'm away from the office! There was a lot of talk about the Fibromyalgia Floatation Project which is worldwide research on the effect of Floating on Fibro. This is exciting research! And yes, we will be part of this project in the future! Take time to find out about the study HERE. Mark and I spent quite a bit of time with Carl Jessee, who has been working on a Float Documentary. He did a kickstarter fundraiser earlier this year and rasied all his money and then some in 3 days! It just goes to show there is a passion and an interest in floating! On his trip across the U.S. he planned to stop in Nashville so we could be interviewed, unfortunately during that time we were in Portland, OR completing an apprenticeship. But we were glad for the time we had at the Conference. He is incredibly talented! Check out the trailer HERE. After getting a chance to float in a Tranquility Tank by Floataway, I had the opportunity to spend time with Colin - owner of Floataway and designer of their beautiful tanks. We had originally wanted a Tranquility, but knowing what we were up against with the health department chose a tank that we felt would be approved easier. But I think the future may eventually hold one of these in the tank center. What do you think? Yes? No? 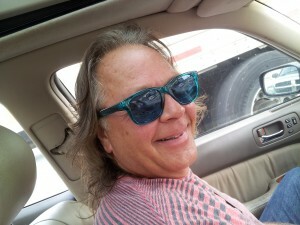 Mark is sporting his turquoise blue color therapy glasses! We got to try out some Color Therapy Glasses. Can colored lenses change your mood? I'm not sure. Some people swear by them to help maintain the feelings post-float. You can check out some of the possible medical benefits HERE. I can tell you, they are lots of fun to wear! We may just have to offer them at the shop. Floating enhances creativity. Want to see that in action? Check out the Float Dance project done with several Portland, OR dancers and Float On. They floated, then developed a dance inspired by their time in the tank. Beautiful videos were created and debuted at the conference. This wasn't all we learned about! The speakers were amazing! We had talks from several major Float Tank researchers as well as neuroscientists, medical doctors and more. You will be able to see every speaker and feel like a part of the experience as the Float Conference website slowly adds video of each talk done throughout the conference. You can find all the float conference videos on their website. I encourage you to check them out!